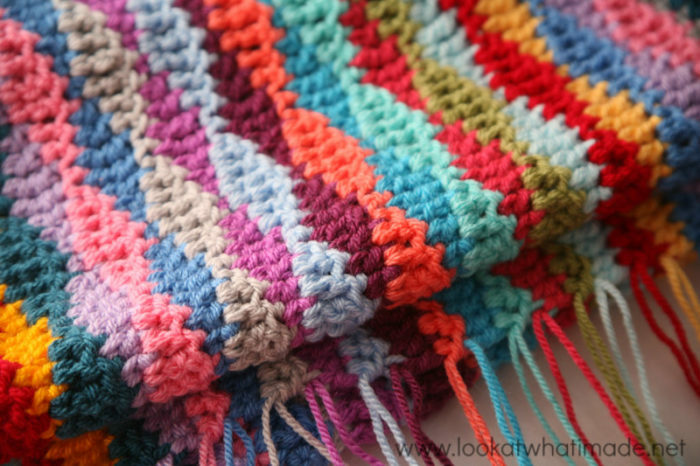 I am head over heels in love with this Lazy Waves Blanket. It is thick and squishy and brilliantly simple to make. I started working on this blanket almost a year ago but then put it aside to focus on the Block a Week CAL 2014. A couple of months ago I got a sudden urge to finish it, and I have been working on it whenever I could find a few minutes in the evenings. You have no idea how thrilled I am to finally be able to sit under it! I have used Stylecraft Special Dk (2 strands at a time), but you can use 1 strand of worsted weight yarn instead. It should come out more or less the same size (depending on your tension/gauge, of course). 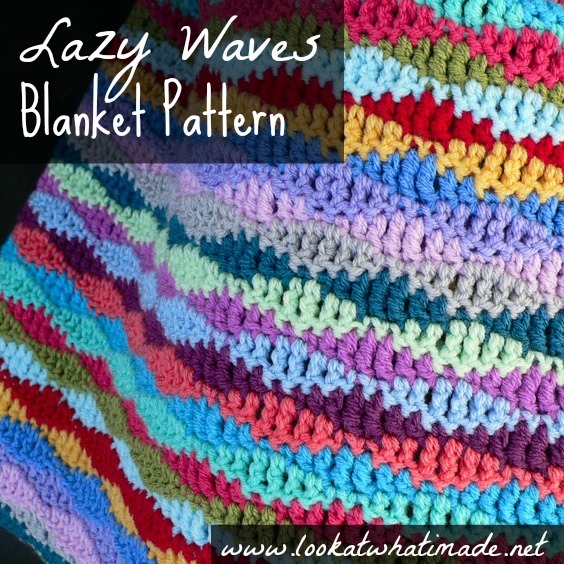 This Lazy Wave Blanket is an awesome stash-buster. You probably won’t notice, but I have used Clematis instead of Fondant on some repeats, and Grey instead of Silver on others. I don’t think it makes a jot of difference and it allowed me to use up 2 lots of scraps so that I can buy some more. Please note: Using 2 strands of double knit yarn instead of 1 strand of worsted weight, there was a difference of 2 mm at the end of 4 rows, which means that it doesn’t matter which of the 2 roads you choose to go down. If you have a look at the photo on the left, you will see that the blue swatch (2 strands of dk) is slightly larger than the grey one (1 strand of ww). Working into the top loop only of each ch st: Dc in the third chain from the hook. Dc in the next ch. *Tr in the next 2 chs, dc in the next 2 chs, sc in the next 2 chs, dc in the next 2 chs*. Repeat from * to * until you reach the end of the chain. If you have started with 164 chs, you will repeat the instructions 19 times, giving you 20 repeats in total. The last st of the last repeat should fall in the last foundation ch st. Change colour on the last yarn-over of the last dc. Ch 1 and turn. This ch st does not count as a st.
Dc in the same st as the turning chain (see this tutorial if you are unsure which stitch that is). Dc in the next dc. *Tr in the next 2 sc’s, dc in the next 2 dc’s, sc in the next 2 tr’s, dc in the next 2 dc’s*. Repeat from * to * until you reach the end of the row. The last st of the last repeat should fall in the last dc, not in the turning chain (which doesn’t count as a stitch). Change colour on the last yarn-over of the last dc. Ch 1 and turn. This ch st does not count as a st. When you feel that your blanket is long enough, bind off and work away your tails of yarn. Stylecraft is an awesome budget yarn that feels (and washes) way better than most acrylics. 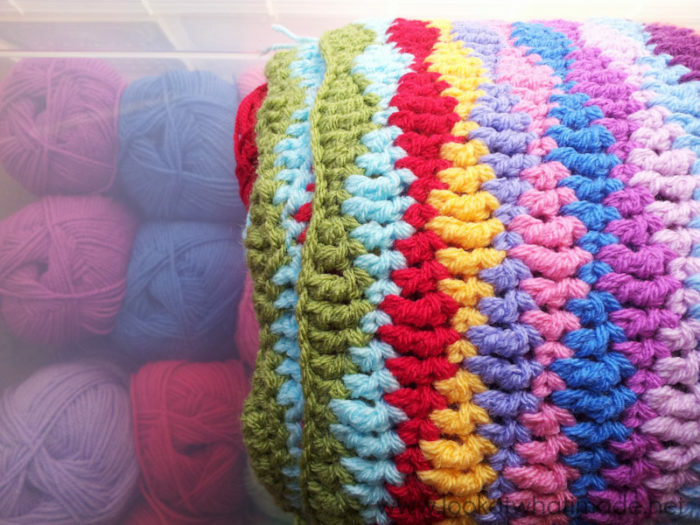 You can buy the “Lucy” pack (which contains exactly 17 balls), you can use the 17 colours I used (listed below), or you can use stash yarn and make the blanket outrageously colourful and awesome! If you prefer worsted weight, I highly recommend Deborah Norville Everyday Worsted Weight Yarn. It is anti-pilling and feels unlike any other acrylic I have ever worked with. It is soft and sturdy with just the tiniest hint of a shine. I used it to make the animals for my book, Amamani Puzzle Balls , and loved it so much that I bought a whole lot more. Below you can find a list of Deborah Norville colours that best match the Stylecraft colours I used. In fact, bar 2 colours that they do not stock and 2 colours that are a slightly different shade, the colours match perfectly. I don’t like crocheting over my ends, because I work them away backwards and forwards, so I have to get the needle out even if I do crochet over them. I believe (and this might just be because I don’t do it often enough) that it slows me down fiddling with holding the yarn in place to crochet over it. 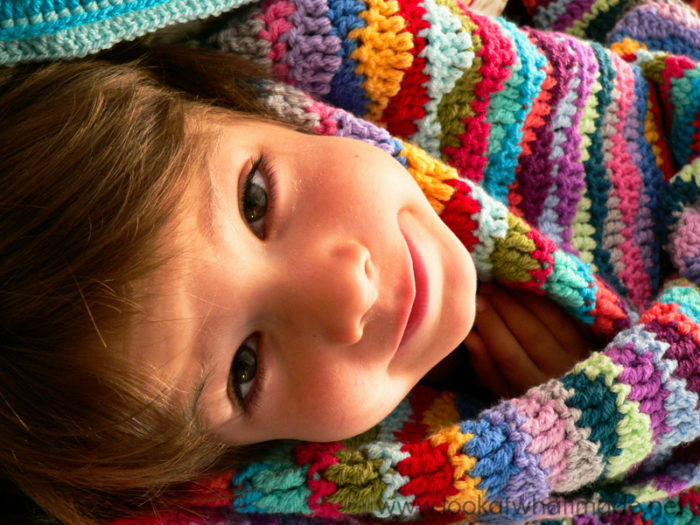 When I made this blanket, I hadn’t seen Jo’s No Needles Needed tutorial, otherwise I would have used that instead. 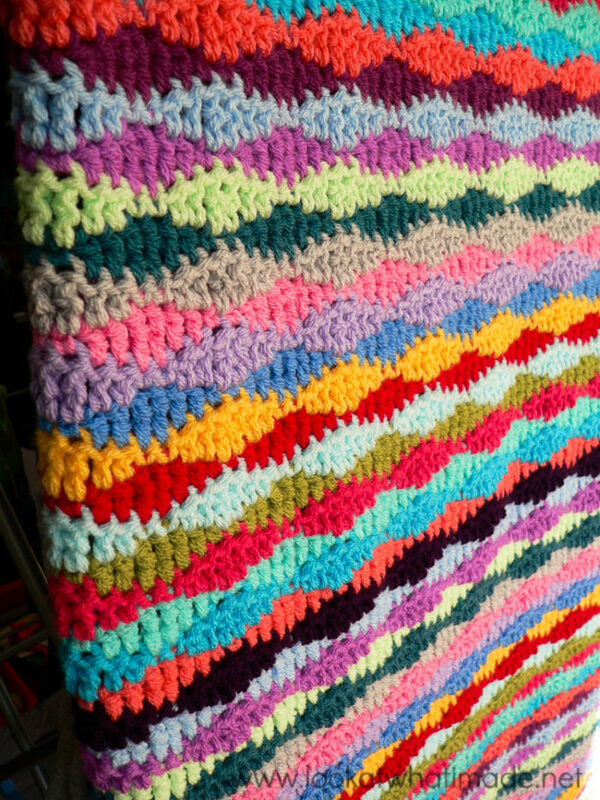 You can, of course, add a border if you want to, but this blanket is specifically designed so that the edges will be neat and straight. The ch-1 turns are not visible or bumpy and there are no gaping spaces at the start of each row. I hope you have great fun with this pattern! I am trying to make a small lazy wavy cot blanket before embarking on a larger one. Yours is so pretty, I love it. I just wanted to check that when working the right side, the loop from the stitch in the previous row is on the right, and when working the wrong side, the loop is on the left. I think I am doing it correctly, and have studied the tutorial about making the first dc in the base of the chain stitch but I still seem to be short of a double crochet sometimes at the beginning and end of some rows!! It’s odd as I have just finished your beautiful Sophie’s Universe without major problems, but can’t seem to get my head around this lovely pattern which should be easier! Hi Maureen, sometimes the easy patterns just cause more grief than the complicated ones. Don’t worry about that aspect of it at all. I think I know what is confusing you. When you are working with the right side always facing you, the right side of each previous row/round will always be facing you and therefore the loops will always be to the right (if you are right-handed). When you turn your work at the end of every row/round, the WRONG side of the previous row will ALWAYS be facing you, regardless of whether the right or wrong side of the entire project is facing you. 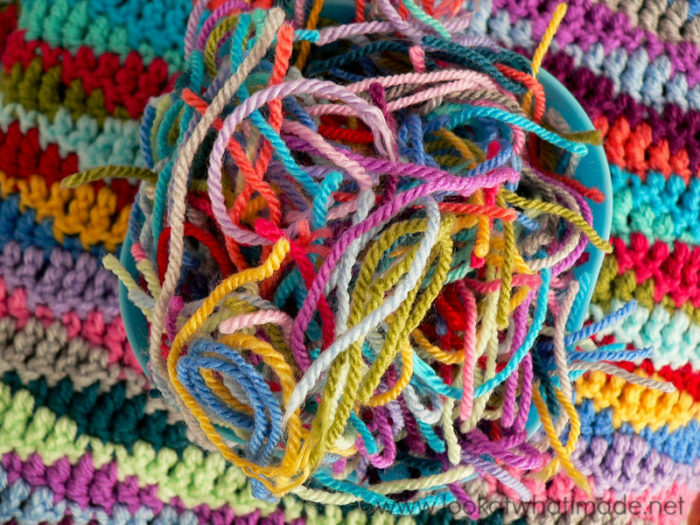 So, when you are turning like this, the loops will ALWAYS be to the left of the post (if you are right handed) because you are always looking at the wrong side of the stitches. Does that make sense? When I get confused, I turn my work so that I can see the right side of the last row. Then I stick my hook into the stitch I want to identify. When I turn it back around, I can see which stitch/loops I am aiming for. Have another go and let me know how it goes? Hi – could I knit this using one strand of DK? 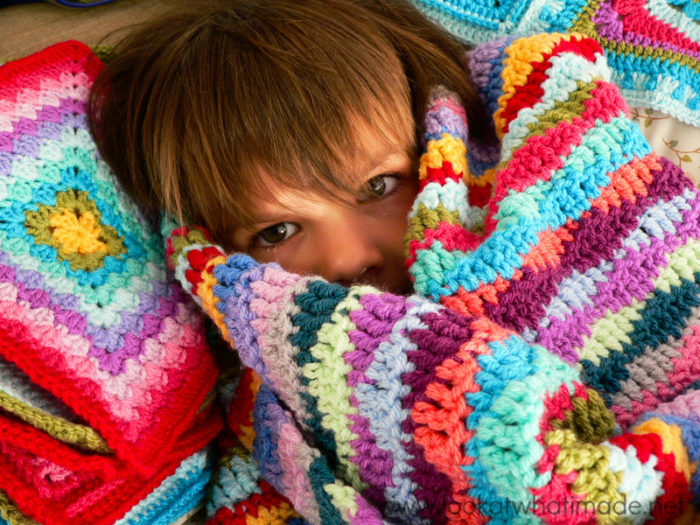 If so – what size needles should I use to make a similar size blanket? I am starting this now! 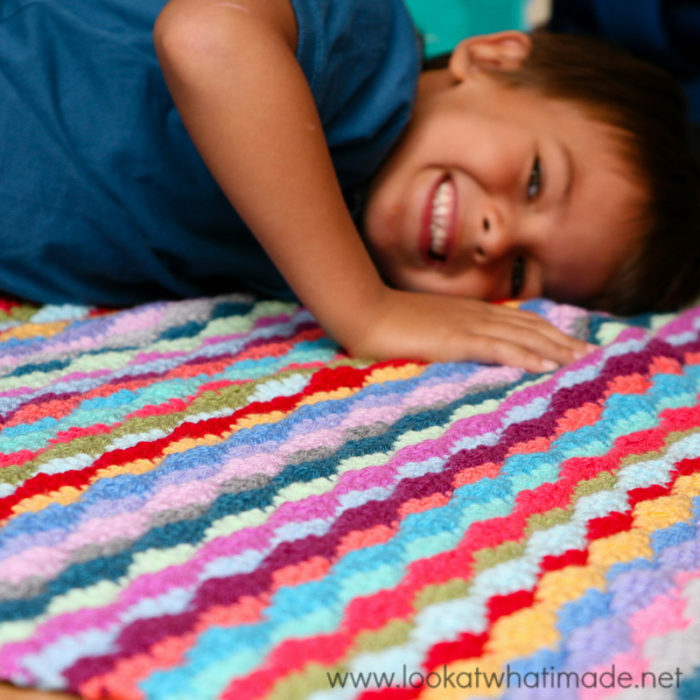 I have so much left-over yarn and was looking for a different scrap blanket rather than the same old granny or straight stitch patterns. I think this is going to be just beautiful! Thanks! 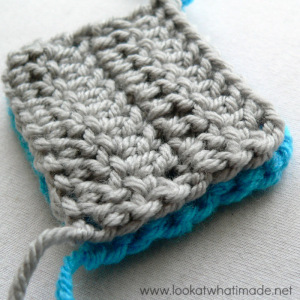 Oh, and thanks for the link to Mama Jo’s No Needles tutorial! It’s great! I don’t know why I didn’t think of this. 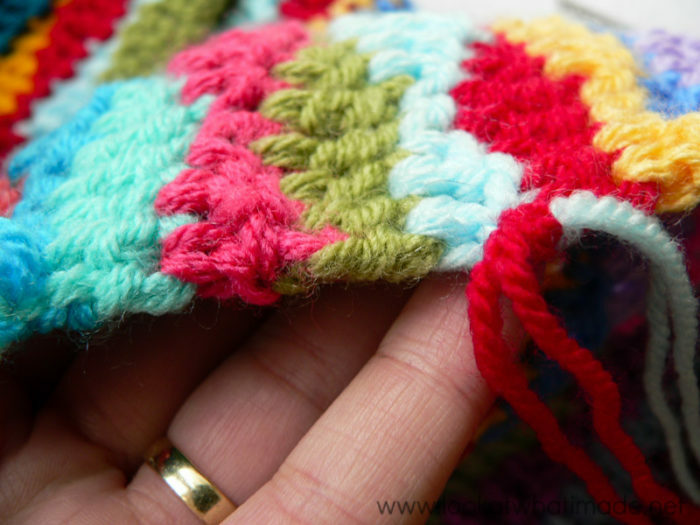 I do not mind sewing in ends at all…it is part of making a long-lasting, beautiful blanket. But, this saves so much time! Hi Lisa. I’m glad you found that tutorial useful. I prefer working my tails away, but I know many people hate doing it. Beautiful! Your shawls are also nice. Thanks for sharing.